–when I came inside a moment and Richard asked me if I still wanted to go? He’d forgotten to tell me about the invite. I had no idea. Yes of course I wanted to go! Dinner suddenly became whatever could be ready in five minutes and then we were off to our friends’ for a house concert. I would have offered to bake a hazelnut torte or something had I known. 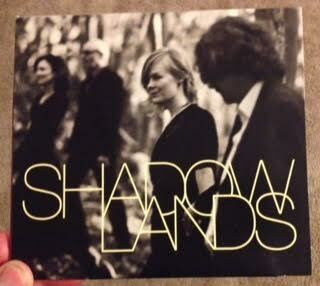 Beautiful vocals, beautiful instrumentals, getting to meet and appreciate the musicians and them getting to see their audience loving what they do, and Shadowlands’ CD tomorrow for Mother’s Day. Definitely the way to spend a Saturday evening. Dirt still under the nails and all. 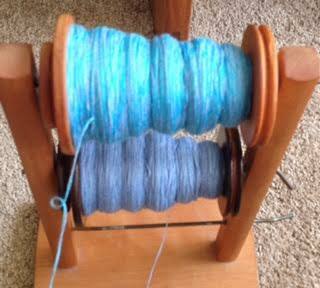 Spun another skein like yesterday’s. One more of that and I think the red sparkly will be all used up and then I’ll put the last of the plum with the last of the purple. Saw an overly hormonal squirrel doing flips and backflips and loop-the-loop leaps, jumping around again and again in this one spot of grass-free fine dirt that he flung high in the air as he did his little acrobatic shtick for the ladies. Another spray of dirt and another. I own the air! I own the ground! I make them one! While I sat watching out the window thinking, well, I guess that answers my question whether I put enough water there for the squash to sprout. 1. 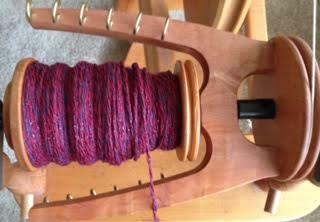 So then I tried spinning just the plum and the red sparkly today and got these 272 four-plied yards. 2. 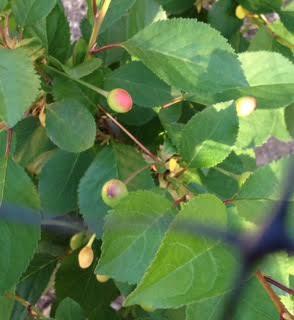 The tart cherries are trying to catch up to that color as fast as they can. You can tell which side the sun hits them on . 3. This video of Glenn Stewart rock-climbing city hall and banding baby peregrines. 4. It was the last Thursday night knit night at Purlescence: attendance has been low of late (all those political debates on Thursdays, I’d say) and they really did need the extra space for classes. So of course it was quite the turnout tonight. I’m so glad I got to go (thank you, Richard) especially given that I’m not driving yet. 5. Meantime, we got the very happiest of messages: Crystal, our seven-weeks-premature new grand-niece, after a month in the NICU was pronounced healthy and allowed to go home today. Her parents are ecstatic. We are, too. And then there was Sherry’s other part cone (thank you!) of Colourmart cashmere in purple. 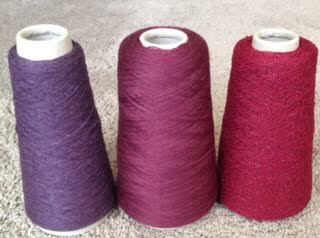 I had some plum extra fine merino and some red cashmere/merino/sparkle, from same, all of them very fine and soft yarns. 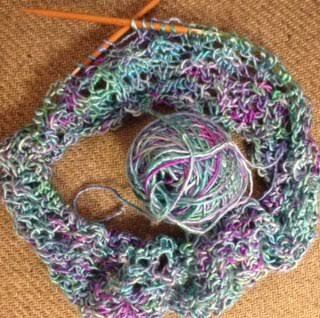 I plied about a yard of all three together but stopped the wheel, thinking, when that becomes six? No. Too thick. Pulled that off and started over. Sherry’s with the red, one bobbin, the plum with the red, second bobbin, then ply those two together. Yeah, I like that. I like that a lot. And yes, you don’t have to have a wheel, you can just knit from any number of cones straight up–but a single ball of yarn at a time is simply a lot more portable than three cones of delicate snaggableness. I was thinning the Fuji apple tree–a task I have never had to do before, but this year for the first time the tree is loaded–when I learned that a cluster is more connected within itself than to the tree, so instead of reducing three to one I suddenly had none of those particular ones for September. The tiny ones at the bottom are from the year-old columnar apple, which started off with nearly as many apples as leaves. I figure one for us, one for the neighbor, one for backup and that’s plenty for the little thing to have to do for now. Meantime, with all the yarns I’ve plied on my wheel of late, still this silk leaped out of my stash and onto the needles for now. I figure it has its reasons. Which is how I was close enough to the glass to have the patio overhang not in the way of seeing the raven doing a steep dive down and right back up again right in front of the path of the oncoming hawk that ignored it and came zooming in across my yard and around the bird feeder a few feet away from me, wings and tail wide at the turn to brake, and then away! in hot pursuit of some other bird altogether. Exit! Stage Right! Whether the raven was trying to defend territory, if it suddenly saw and pulled out of the way of the hawk just in time or whether it was trying to steal prey when there wasn’t any yet or what it was trying to do I do not know, but the whole thing made quite a show. If ever so briefly. And then I realized I still needed to put the other clog the rest of the way on. But only two of the baby peregrine falcons. One egg never hatched, one only survived long enough to hatch, but the other two? Doing fine. Here are the little fluffballs now. 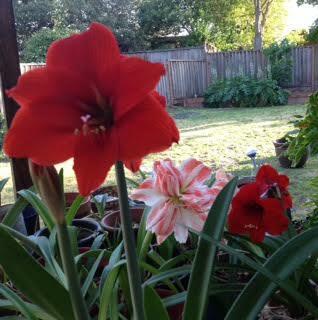 A Dancing Queen and a Red Lion amaryllis that my dad gave me for my birthday several years ago. And if you look way in the background, that’s my Baby Crawford peach that I planted in January in front of the fence and the third-year Stella cherry at the far left. It’s the most amazing thing. You gouge a little hole out of the dirt, plunk in a stick, cover it up and it turns into fruit all on its own, for years and years and years to come. Well, not the amaryllises but they earn their keep, too. And on a side note, just because it tickles me. The Grammy Salute to Music Legends that just happened: my cousin David, a musician and actor in NYC, just flew to LA along with his almost-95-year-old dad to accept a Grammy award on behalf of David’s late grandfather, Harvey Fletcher. The inventor of stereophonic sound, not to mention the first audiometer (I’ve seen it, it’s at Johns Hopkins, built into a gorgeous wood case) and hearing aids. For what he did for the world of music. I love that my uncle got to be there and accept that. Rock on! And that is why two Sharlyn seedlings went into the ground today, surrounded by Wool Pellets (the little brown raw-wooly stuff around there) to keep the snails away, hold water in the ground, do a little fertilizing and all the other good stuff they said but the best reason I can say right now is how fast a squirrel made an about-face when he got close enough to get a whiff. Highly gratifying. The English Morello cherry was growing through its 36″ tent pretty badly and I was impatiently waiting on the arrival of a bigger one. Seeing leaves on the outside the old may be why a squirrel took a flying leap at it today, only to be bounced back instantly to where it had jumped from–that thing was pretty taut. Trampoline! The new one came today. Carefully taking off the old NuVue, it was a little startling how much bigger the tree instantly was. It really had gotten squished in there, it wasn’t just my imagination. Photo is of the tree inside the new, with a frost cover around the bottom till I go buy more stakes–it needs them. The Gold Nugget mandarin, having doubled in height since January, is also quickly outgrowing its 36″er. When the cherries are picked I’ll move the new big tent over it. Meantime, we just had a hot week and the buds on the mango have finally, finally started to swell. If I could bottle the perfume we’re about to get I could make quite the fortune. Heavenly. Uh, Houston, we have a negative on that trajectory. The doctor on the phone today decided I didn’t seem to need imaging for a brain bleed but if things were in any way worse in the morning speak up (it was, and that’s exactly what I did today) and we’ll move that neurology appointment forward. When she said rest for once it was easy to do. Stabs said my head really didn’t want me to turn it to the left. They did let up a lot as the day went on. 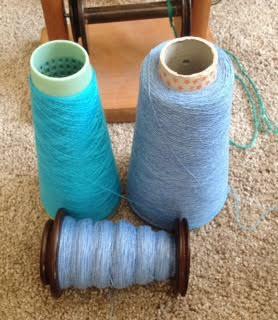 And so off and on across the afternoon I did manage to get one bobbin plied. One really pretty bobbin that just makes me happy to look at, some Zegna Baruffa Cashwool that I stumbled across while looking for something else and went, oh, that’s what that peachy-pink has been waiting for all along! More of Sherry’s cashmere. Add spinning wheel and there you go. I found this in a description of the production of that superfine wool: the pasture must be perfect and only calm sheepdogs need apply. There must be no stress on the Cashwool-worthy merinos. Sounds good enough to me to pair with Sherry’s gift. Colourmart was selling 10g mini cones of cobweb cashmere/silk for $5 a year or two ago, ppd as always, enough to put a pop of color in the right place and I always knew they could really turn into something–if I only knew what. Now I know what the what is. 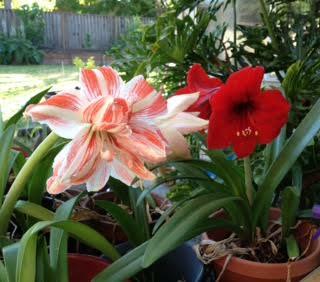 Sherry’s blue cashmere danced with a matching light blue, and then the second cobweb mini-cone in turquoise that it totally clashed with before I held up their two strands and twisted an inch or two together and thought, wait, I do like that –okay, go! 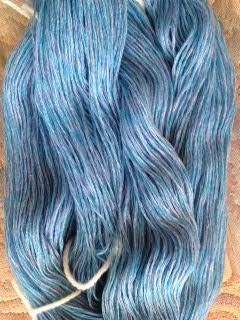 That makes 484 g, including ties, and 1358 yards of the dark/med/light, in merino-silk/cashmere/cashmere yarn. Writing it down so I can find it later for sure. It looks like I spun a raccoon. Or a tabby cat. And then I started in on a new batch: the same medium and light brown cashmeres and adding in a white strand for the third, plying it back on two strands of the light brown, of which I have much. But that’s not the interesting part. The interesting part is that I went looking in my stash for a particular old cone to do that with but right there behind the door was one in the color I wanted marked Crudo. Hey. That’s not merino, that’s cashmere, too. This spinning project just went up a notch. The inside of the cone had the number of yards left scribbled on it to warn myself it wasn’t the full 150 g anymore–and it dawned on me when I had used that cone before. And, best of all, that I had made it for her. She cherished it, which comforted me when I had come to try to comfort her. That white cone definitely has memories. I need to do right by the rest of it. Somehow, “Sittin’ on the Dock of the Bay” instantly sprang to mind. She was tucked in and snoozing before I pointed my phone at her. Given that a mourning dove will drop a small twig and call it a day on the nest building, I was wondering a moment there if we were going to have an egg roll. Or egg drop soup, anyway. And yes, the mandarin’s tent is inside a cage these days after a raccoon pushed in one side but couldn’t get through. The New Yorker guy yesterday laughed when I said, We’re the McDonald’s of churches: you can go anywhere in the world and it’s all the same. You know what to expect. And I described being asked to play piano on the fly years ago for a small Vietnamese congregation near Seattle and it was the same hymns, although there were not as many to choose from. I pictured someone struggling with translating both the words and the musical phrasing and only so many had been done back then. The bishop and I were chatting briefly today about what a wonderful, memorable experience yesterday was. We found ourselves saying, in enthusiastic unison, We have to do it again! Which means that knowing him and if it is okay with them it will happen. I am so glad! So there were these two Boy Scout leaders striking up a conversation recently and getting to know each other at some Scout thing or other. One was Muslim and one was our Mormon bishop. Together they hatched an idea. And that is why today we bought half a dozen Costco packs of toothbrushes and happened to walk in the door at our church at the same time as a Muslim man was walking in with a stack of toothpaste boxes. A lot had been donated. People were really throwing their hearts into this. Long rows of tables were set up with shampoo, deodorant, dental stuff, soap, kleenex, crayons, coloring books, etc: grab a bag, walk the lines and fill’er up. Boxes of diapers over here. I would have brought finger puppets (some pictures here) had I thought of it and had I had enough. Housing costs are so breathtakingly high here that we don’t have refugees resettling in the area so we were doing this for a homeless shelter. The big room was full of people, all of us wanting to come together to help our fellow man and to share the experience with others of faith that we’d like to get to know better. A side row of tables was full of snacks and cheerful people making sure there were more. There is an old Mormon how-many-to-change-a-lightbulb joke. Three: one to change it and two to serve refreshments. I noted with a laugh that all the refreshments looked pretty healthy, lots of fresh fruit there. Actually, though, we do like our baked goods and desserts as much as anyone, just don’t tell. One man had emigrated here as a child and had grown up in upstate New York and was thrilled when I told him I’d hiked Watkins Glen as a kid and loved the waterfalls. He said his kids didn’t understand this weird concept of shoveling snow and what it was like. At. All. Yeah, ours neither, we laughed. It was a chance to ask religious questions of each other, too, in a safe and welcoming place. Our New Yorker friend wished they had a building such as ours to meet in and several people asked for a tour. Then several more, so Richard took a second group around to see, about the time the first circled back to the main room. I can’t wait to do something like this again. And Jasmin, the New Yorker guy lived for a few years in your neck of the woods and thought he remembered, almost remembered, almost could place your family’s names. Abrara says hi.